First, there was the shooting at Marjory Douglas High School, then the call to action by the Douglas High victims and students, then the Legislature passed a school Safety Bill; the governor signed it. Now all we hear is carping and complaining from sheriffs, police chiefs and mostly from school district superintendents about money and how they will pay for all of this. The legislature provided some money, but that was redirected from school funding all the more to the ire of local school boards, superintendents and educational “leaders." Let me tell you what I haven’t heard. I have not heard of any plan from school systems to lower costs, to reduce administrative staff or overhead. No attempts to push school planners for more efficient schedules for everything from transportation and maintenance to classes. No plans to reduce expenses for sports, arts and other niche educational programs that serve a few provided by the school systems. No, the school boards want to keep doing the same inefficient job and pad their funding by holding your kid’s safety hostage. It seems they have all seized on this safety issue as an opportunity to go fishing for more funding. If law enforcement from Sheriff to police departments needs to staff up to provide school security, funding should be forth coming immediately from the State, and there should be no reduction in overall policing to accomplish the school security task. All of this will take time to hire, train and equip deputies and police officers for the task. The real question here is: are the law enforcement agencies going to provide school security as a public service or are the school systems going to “buy” this service from law enforcement? From a dollars and sense perspective, it really does not matter since the money all comes from the same place, your taxes, regardless of who handles it. 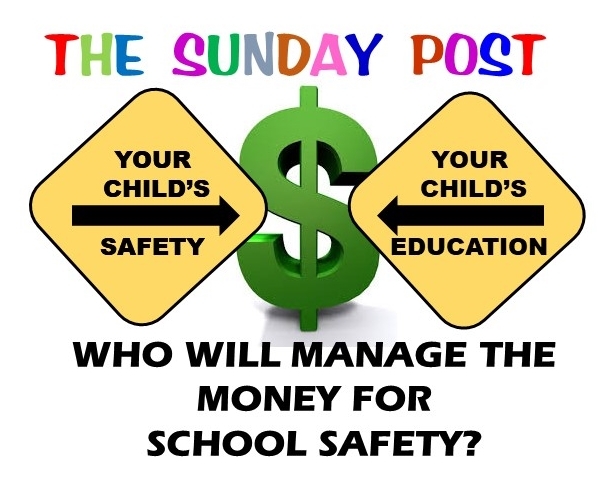 I for one, would much rather the State fund law enforcement directly to provide the service to the schools and keep school boards and their administrator's fingers out of the money flow. School Boards are notoriously poor in administering these types of agreements, and they will add several layers of bureaucracy, all at our expense, to oversee, manage and complicate the issue. These school systems would like nothing better than a new large stream of cash flow that they can manage, massage, manipulate and hold back to keep law enforcement “in line." The Legislature should step up and establish a per school resource officer level of funding for each county in the state and supply the funds to the local sheriff who sets the staffing levels and who can provide the service or contract with local police agencies. Now it's all law enforcement all the time with no complications.